These short pieces will be a barrage of footage from local bike shops. We’re asking filmmakers to send in their footage. If yours is used, you’ll get credit in this project. See below for how to submit your footage. Bike shops are the heart of a bike community. Without them, our bike lives would lack the important connection to the very essence of what it is to ride a bike. We all ride for different personal reasons, but those reasons are woven together with the common threads of health, community, freedom and exploration. Add to that a sense of better knowing the world around us. And the people around us. What would that world be like without local bike shops? We don’t want to have to find out. Between shop visits, shop sales, bike sales and manufacturers sales, the bike industry was down significantly in 2016. 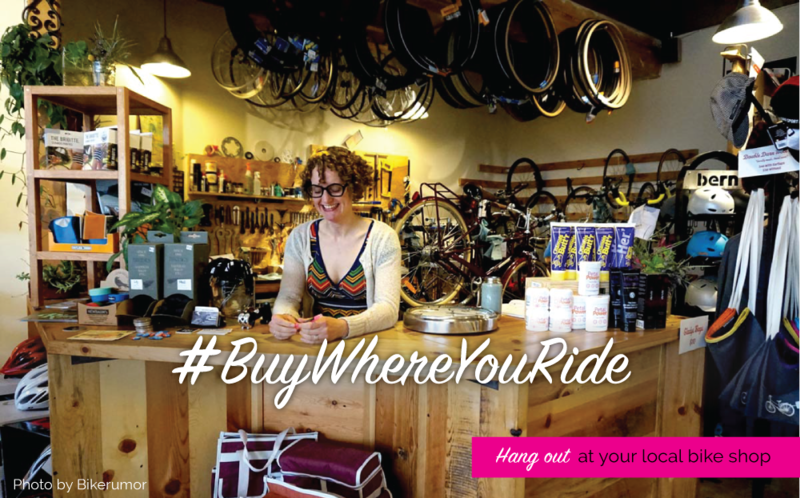 Visiting your local bike and making a purchase goes a long way toward keeping those shops alive and well. Filmed by Bike is a thriving film festival that features the world’s best bike movies. Founder and Festival Director Ayleen Crotty started the festival while working in the trenches of a non-profit bike shop, the Community Cycling Center. She saw first hand the strength of community – the family – of people who supported the shop, worked there, came in as customers and were the shop’s vendors. Send it to us via Dropbox: Submissions@FilmedByBike.org. Upload to Vimeo and make it downloadable. Use a transfer service and send to Submissions@FilmedByBike.org. We can’t guarantee your footage will be used. Filmed by Bike features a gigantic film festival every spring in Portland, Oregon then our movie collections go on tour all over the world. The #BuyWhereYouRide mashups will be seen all over the world and through our robust social media.